I remember trekking out to the Parkside years ago to see local bands and enjoy cheap drinks. I recall ordering vodka with orange juice and being told they did not stock juice...how to make a screwdriver? My drink arrived day-glo orange and I didn't bother asking. 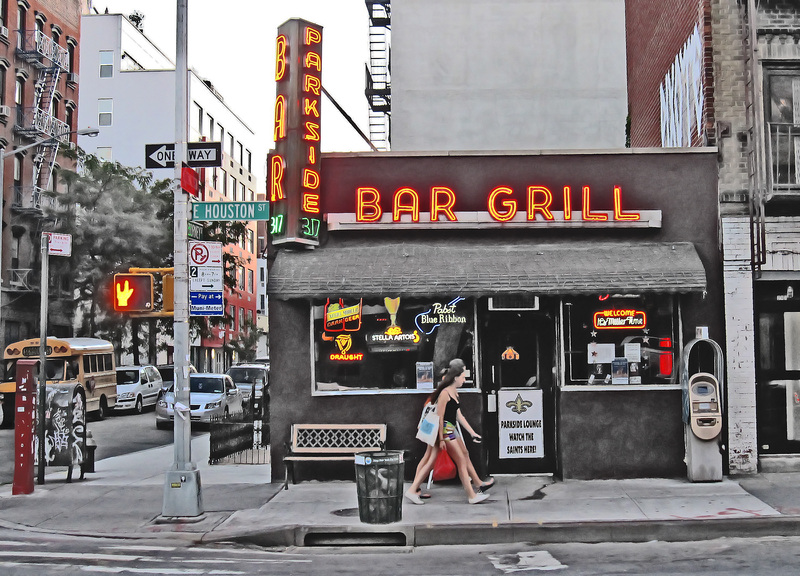 Back then, the Parkside felt like it was on the edge of civilization, way out on Attorney Street, which felt so distant and desolate late at night...and nowhere near a park. I went in recently on a Sunday afternoon and was happy to find the place empty, save for a lone pool-player. The interior looks a lot less divey than I recall, but I was still pleased to see all the board games and game tables, instantly making me feel at home. Parkside - A friend told me about this place a few months ago and I've been trying to remember where it was. Now I know. Glad to hear it's still a dive. And now I know where it is. The place has been spruced up quite a bit, but I still recommend dropping in on an afternoon (it can get pretty crowded at night). Decent bathroom, too - that's important! A great bar and lots of free live music at night. You have to love a bar that supports bands and hasn't surrendered to karaoke. You captured it great in your photo. Love the neon. I love this photo too! !The neon orange liquid might have been Tang. You know the stuff the astronauts brought with them on their space adventures-sold in jars. Melanie - you may be right about the Tang. I recently noticed Mona's serves Tang-flavored vodka, so maybe it's making a comeback...Tangtini, anyone?